The University of Florida George A. Smathers Libraries respect the intellectual property rights of others and do not claim any copyright interest in this item. This item may be protected by copyright but is made available here under a claim of fair use (17 U.S.C. Â§107) for non-profit research and educational purposes. Users of this work have responsibility for determining copyright status prior to reusing, publishing or reproducing this item for purposes other than what is allowed by fair use or other copyright exemptions. Any reuse of this item in excess of fair use or other copyright exemptions requires permission of the copyright holder. The Smathers Libraries would like to learn more about this item and invite individuals or organizations to contact the African Studies Curator (danrebo@uflib.ufl.edu) with any additional information they can provide. trade and its political implications. I agreed to do so on a professional basis. The sponsors requested that their names be kept secret. proximity to elephant populations not to take advantage of such wealth. In the circumstances no law is likely to succeed in preventing its use. aspect of the ivory trade has consistently been ignored. provide impenetrable cover for illicit elephant hunting. This is true. exist regardless of Governments and ideologies. Wardens and Police officers in illicit ivory was presented. appears to have diminished and been replaced by African involvement. important in the ivory trade recently. Warden was obviously pivotal to all recorded ivory exports. that as a small facet the 'rackets' might be stopped. the sponsors should so involve themselves. the report with the statement that it was too "hot". divulged to the world public, nothing would be gained except embarrassment. of the sponsors to the Government. apparent as requests included waking me at midnight. fields of Kenya's life. Either course would be of value to the sponsors. warned that the international Press were aware that something was in the wind. immediate action would follow his reading the report. international papers onto asking J. Block and myself for copies). asked to file this letter confidentially. y. /' CONFIDENTIAL P. O. Box 30678, Nairobi. 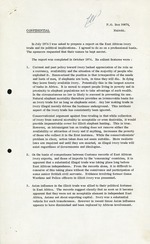 In July 1974 I was asked to prepare a report on the East African ivory trade and its political implications. I agreed to do so on a professional basis. The sponsors requested that their names be kept secret. The report was completed in October 1974. Its salient features were: 1. Current and past policy toward ivory lacked appreciation of its role as a currency, availability and the situation of the majority of people who exploited it. Summarised the position is that irrespective of the needs and lusts of men, if elephants are born, in time they will die. In dying they leave freely available ivory. Potentially this is the largest source of tusks in Africa. It is unreal to expect people living in poverty and in proximity to elephant populations not to take advantage of such wealth. In the circumstances no law is likely to succeed in preventing its use. Natural elephant mortality therefore provides an irremovable basis for an ivory trade for as long as elephants exist. Any law making trade in ivory illegal merely drives the business underground. This intrinsic aspect of the ivory trade has consistently been ignored. Conservationist argument against free-trading is that while collection of ivory from natural mortality is acceptable or even desirable, it would provide impenetrable cover for illicit elephant hunting. This is true. However, an intransigent ban on trading does not remove either the availability or attraction of ivory and if anything, increases the poverty of those who collect it in the first instance. While the conservationists' problem is clear, action taken does not seem suitable. More realistic laws are required and until they are enacted, an illegal ivory trade will exist regardless of Governments and ideologies. 2. 01 the basis of comparisons between Customs records of East Mrican ivory exports, and those of imports by the 'consuming' countries, it is apparent that a substantial illegal trade was taking place long before East Mrican independence. From the records alone, it is difficult to conceive of this taking place without the connivance and participation of some senior British civil servants. Evidence involving former Game Wardens and Police officers in illicit ivory was presented. 3. Asian influence in the illicit trade was allied to their political fortunes in East Africa. The records suggest clearly that as soon as it became apparent that they were not an acceptable element in independent East Mrica, Asians set about exporting capital. Ivory was a substantial vehicle for such transference. However in recent times Asian influence appears to have diminished and been replaced by Mrican involvement. P. O. Box 30678, CONFIDENTIAL Nairobi. In July 1974 I was asked to prepare a report on the East African ivory trade and its political implications. I agreed to do so on a 'professional basis. The sponsors requested that their names be kept secret. The report was completed in October 1974. Its salient features were: 1. Current and past policy toward ivory lacked appreciation of its role as a currency, availability and the situation of the majority of people who exploited it. Summarised the position is that irrespective of the needs and lusts of men, if elephants are born, in time they will die. In dying they leave freely available ivory. Potentially this is the largest source of tusks in Africa. It is unreal to expect people livin.g in poverty and in proximity to elephant populations not to take advantage of such wealth. In the circumstances no law is likely to succeed in preventing its use. Natural elephant mortality therefore provides an irremovable basis for an ivory trade for as long as elephants exist. Any law making trade in ivory illegal merely drives the business underground. This intrinsic aspect of the ivory trade has consistently been ignored. Conservationist argument against free-trading is that while collection of ivory from natural mortality is acceptable or even deSirable, it would provide impenetrable cover for illicit elephant hunting. This is true. However, an intransigent ban on trading does not remove either the availability or attraction of ivory and if anything, increases the poverty of those who collect it in the first instance. While the conservationists' problem is clear, action taken does not seem suitable. More realistic laws are required and until they are enacted, an illegal ivory trade will exist regardless of Governments and ideologies. 2. 01 the basis of comparisons between Customs records of East African ivory exports, and those of imports by the 'consuming' countries, it is apparent that a substantial illegal trade was taking place long before East African independence. From the records alone, it is difficult to conceive of this taking place without the connivance and participation of some senior British civil servants. Evidence involving former Game Wardens and Police officers in illicit ivory was presented. 3. Asian influence in the illicit trade was allied to their political fortunes in East Africa. The records suggest clearly that as soon as it became apparent that they were not an acceptable element in independent East Africa, Asians set about exporting capital. Ivory was a substantial vehicle for such transference. However in recent times Asian influence appears to have diminished and been replaced by African involvement.